Osteo arthritis is a familiar sports injury. Osteoarthritis of the Knee is one of the more regular versions of this condition. Finding out about Osteoarthritis Symptoms and Signs is an essential part of discovering how to deal with the concern. Have you ever tried to life something from the floor and as you lift it, you hear your knee creak as you stand, then you may be experiencing the beginnings of Osteoarthritis. Or maybe, you are walking down the stairs and each step you take results in the emission of a squeak as your knee moves. Osteoarthritis is inflammation of the joints in between the bones. The areas mostly affected are the knee, the hip and the ankle as these carry most of the body weight and are used pretty regularly throughout each and every day. Pain - This can occur at any point in the day and may come and go. It will probably get progressively worse as the day progresses as your joint gets tired of being used consistently. This pain will usually get worse as you get older and the wear and tear on your joints become more pronounced. Stiffness (especially after rest - this usually eases after a minute or so as you get moving) - Your knee may be difficult to move if you have not moved for a little while or on getting up in the morning. A creaking, crunching, grinding sensation when you move the joint - For instance as you walk down or up the stairs, you might start to experience sounds coming from your knees that were not there before. Swelling of the knee - This swelling may be hard or soft dependent on the cause. If it is a result of regrowth of bone then the swelling will be hard but if it is an increase in synovial fluid in the joint then the swelling may be soft. Have a look at Osteoporosis of the Knee to understand that better. Have you ever experienced your knee giving way at the most annoying moment? This may be because your muscles have become weak or your joint structure has degraded so much that it was unable to hold itself in place. Needless to say, this can be quite disturbing. A patient once described to me as a sharp stabbing pain in the knee which was followed rapidly with the knee giving way. Sometimes your knee may just not move freely or even move as far as it used to. Some people have experienced a bowing of the knees. Occasionally, you might be woken up at night with the pain in your knee. At this point, it may be wise to visit your physician or physiotherapist (if you have not already!). Is your muscle feeling a bit thin? Your leg may seem to be wasting away and getting slimmer - not necessarily in a good way. This too could be a symptom of osteoarthritis. There is not always any rhyme or reason to the pain you feel. It might be connected to how active you are that day or whether it was cold or not, it may also just hurt more for seemingly no reason at all. It can be a pretty painful condition to experience which is why people are finding Kneease - a treatment available internationally - to be a great help in taking back a little control over their symptoms. 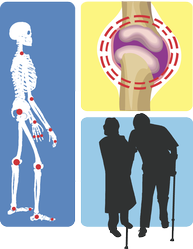 What is osteoarthritis and a few ways that it can be treated. Various ways you can look after your knee joint in a non-drug way. Dealing with cancer? Learn how to react, treat and care for a loved one when you learn they have cancer, during treatment and when facing possible terminal diagnosis. Dry flaky skin can be a painful experience. Itchy dry patches on face can occur due to various reasons. Proper skin care routine for your skin type is the best solution.